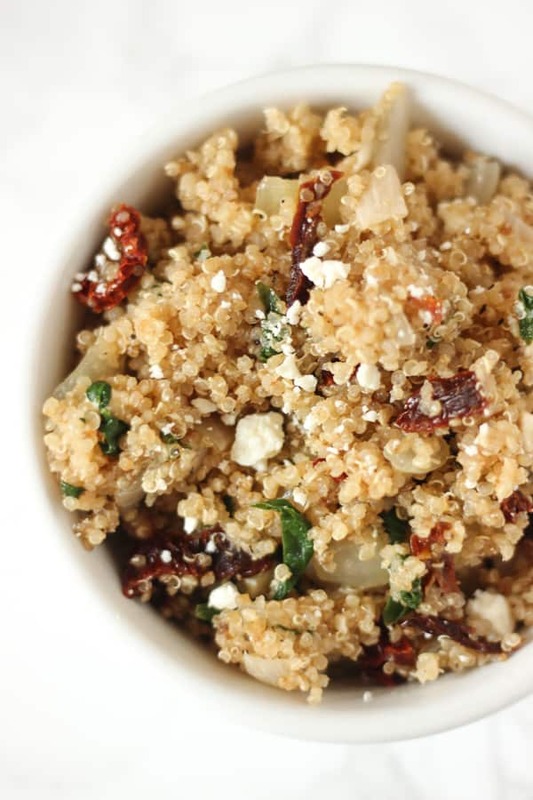 This Mediterranean Quinoa is a super simple side dish or main dish and it’s loaded with sun-dried tomatoes, garlic, and feta cheese! One of my go-to restaurants in Chapel Hill is a place called Mediterranean Deli or “Med Deli” for short. There’s a mini Med Deli located on campus, and the full restaurant is right off campus. It’s definitely one of the most popular student spots. There’s a giant case with full of every type of quinoa, tabouli, and couscous salad you could imagine, plus roasted veggies, chicken, rice, and tons of other delicious things. I could happily order just about anything on the menu, so I usually get a sampler of three items when I go there. Mediterranean quinoa is almost always one of them. I’ve ordered it no less than 10 times and every time I do, I think that I should try making it myself to satisfy those Mediterranean cravings when I’m not at Med Deli. I decided to finally do it this weekend, and I actually found the ingredient list online for their recipe, so I was able to perfectly replicate it with their exact ingredients. It’s just quinoa, spinach, onion, lemon juice, sun-dried tomatoes, garlic, and olive oil. To my version, I also added feta cheese because I always add it at Med Deli. This recipe tastes just about identical to the restaurant version! 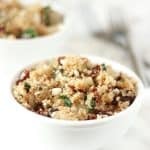 This Mediterranean quinoa is a delicious side dish along with some grilled chicken, or even as an entrée with some chickpeas added for protein. It tastes great warm or cold, although I think I slightly prefer it when it’s warm. It’d be such a fun summer side for a picnic or cookout, and I think it looks more fancy/impressive for company than it actually is because the recipe is so simple! The recipe is also super quick. As much as I love rice, brown rice takes a good 45 minutes to cook, which means I have to start making it wayy before I get hungry. Quinoa is done in just 10-15 minutes! From start to finish, including chopping and sautéing the veggies, I made this Mediterranean quinoa in under half an hour (during exam week…so that tells you how easy this has to be 😉 ). If you try out this Mediterranean quinoa, feel free to let me know in a comment or take a picture and tag me @livbane on Instagram. Hope you enjoy! 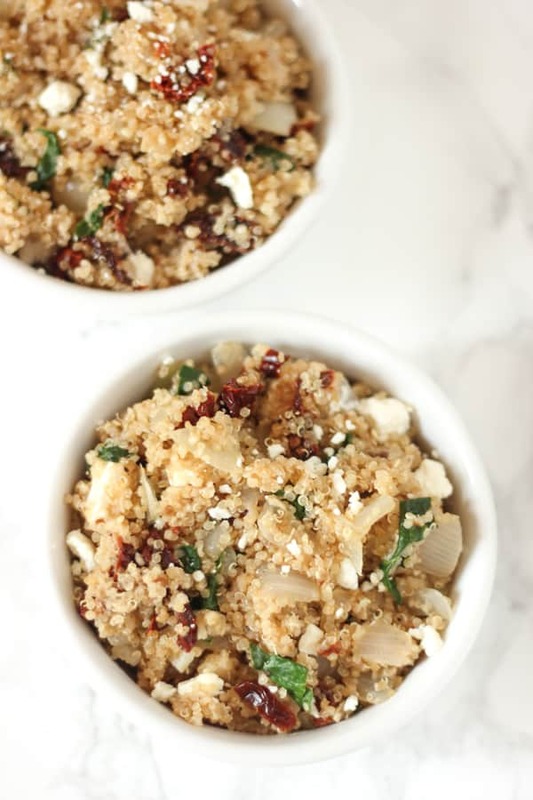 This Mediterranean Quinoa is a super simple side dish or main dish and it's loaded with sun-dried tomatoes, garlic, and feta cheese! In a medium saucepan, sauté onion and garlic in cooking oil until onions are soft and beginning to brown just slightly. Add spinach and stir to combine. Allow spinach to wilt. Remove spinach and onion mixture from pan. Rinse quinoa in a wire colander if you have one, and add to empty pan. Add water, turn heat to high to bring to boil, and then simmer quinoa on medium-low for 10-15 minutes or until quinoa "pops" open and has softened. Stir in salt, pepper, lemon juice, sun-dried tomatoes, and feta cheese. Serve warm or cold, and store leftovers in the fridge for up to 5 days. I love how light and fresh Mediterranean dishes are; that’s so cool that you have a Mediterranean restaurant that you like there. I haven’t had quinoa in a while; this is a really delicious looking way to make it. 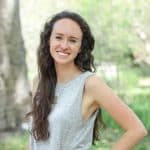 I feel like I can be a bit of a tough restaurant critic (haha) so when I find one I love with fresh ingredients, good prices, and delicious food, I’m all about it! So many delicious flavors in this dish! This looks like the perfect way to enjoy quinoa. love simple quinoa dishes! this looks so good! Quinoa is something I’ve really only started liking this school year, but I agree! It’s hard to beat how simple it is, and I love that it’s a complete protein all on its own! This looks delicious Liv! I need to have more quinoa in my life! So healthy and tasty! Happy weekend girl! Oooooh, this looks amazing! We love anything with quinoa! Thanks, Kristy! So do I- it couldn’t be easier to make! 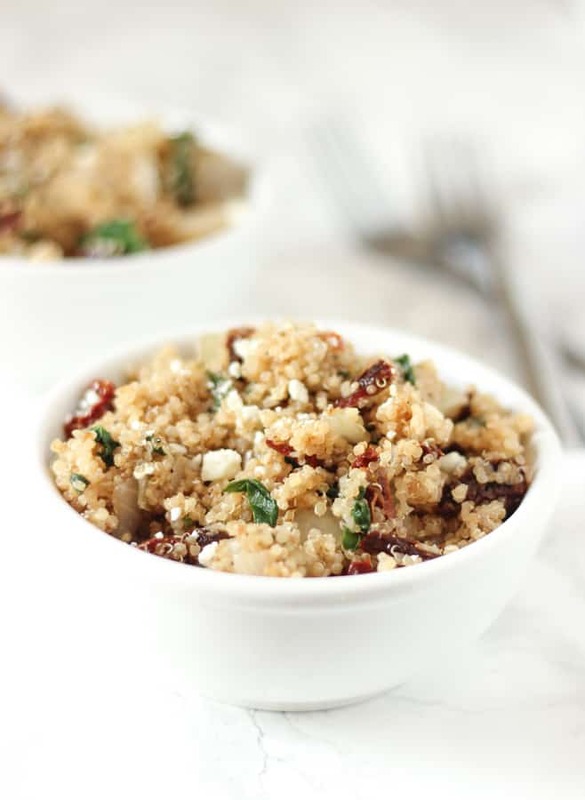 I love quinoa, and I love simple to prepare recipes, so this is a win-win for me! Looks delicious! The recipe looks delicious liv!Quinoa is common in our menu. But this looks different. I will try your recipe. This was absolutely delicious! Thank you. Yay, I’m so glad to hear you enjoyed this, Lauren! this looks great! do you have any info for portion size or calories? So easy and it looks DELICIOUS!